Do you own a house or are you building one? Does is have a roof? Do you want more out of your roof than just shelter? Are you worried about the cost of adding that solar system, well here are some things to consider. 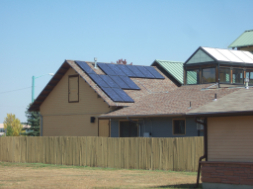 First off there are several ways to pay for those photo-voltaic panels, including buying outright, financing through a home equity loan or a home equity line of credit, a home improvement loan, a secure or unsecure solar loan, or you can lease your solar panels. We do recommend buying your panels instead of leasing them. By buying your panels you are going to see much better savings from and the system is going to pay for itself with in roughly five to seven years. If you lease your panels you will continue to incur those costs for as long as you have them. While you are considering payments and whether or not it is worth it, consider the benefits of them. Solar panels are going to save you money and with the mechanics of them becoming more and more efficient all the time, the saving are going to increase. Adding a solar system to your roof is often times going to completely eliminate your electric bill!. It goes beyond just saving you money though, most times if your panels are producing more energy than you are using you can sell that extra energy back to the grid. Now your panels are not just saving you money, they are making you money. Looking past the financial aspects we get into the environmental benefits of using PV panels. Solar is a clean renewable everlasting source of energy.